Charles Hamlin Writes Of The Phonomenon Of Low Flight Long Known And Often Experienced, Yet The Full Significance Of Which Is Not Widely Recognised. Part I.
Mike Feeney Drops In On The Manawatu Wanganui Gliding Club's Annual Nine-Day Camp. Geoff Best Checks Out The Tiger Moth Club's Recent North Cape To Bluff Rally. Rod Stone Of Gives His Thoughts On Operating The Bell 407 And Compares The Helicopter With Its Contemporaries. 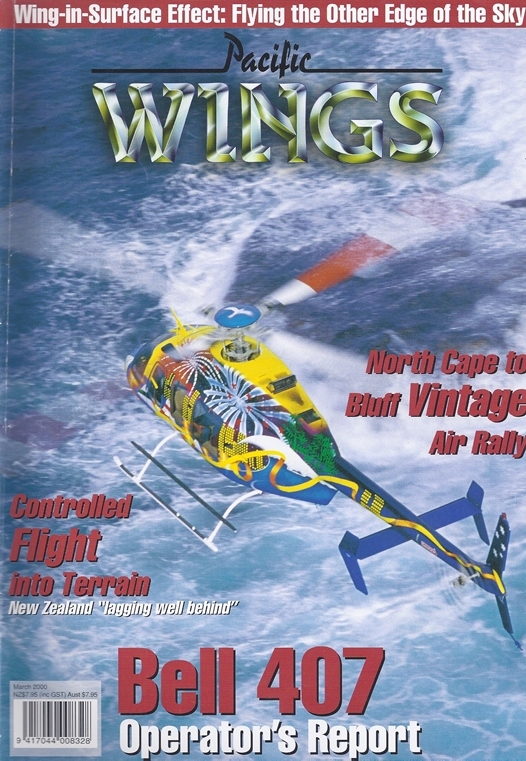 Controlled Flight Into Terrain - New Zealand ""Lagging Well Behing"
Captain Stu Julian Comens Up With Practical Answers To Address The Importatn Issue Of Cfit - Answers He Says That Are Available Now And That Don’T Cost An Arm And A Leg. Ian Young Profiles The First Great Northern Air Race Of The Second Millennium. Peter Clark Investigates The New Boeing 737 Stable Of Airliners.